The ancient Roman city of Jerash (also known as Gerasa), and the current modern city by the same name, are located about 48km north of Amman, Jordan. It’s the second most-visited site in Jordan, with Petra being the first. People have inhabited this area as far back as the Neolithic Age, around 7500–5500 BC. Archaeological digs in 2015 uncovered human remains dating to this period. There is also evidence of settlement in the area during the Bronze Age (3200 BC – 1200 BC). Originally, in Pre-Hellenic times, this was a small village known as Garshu. 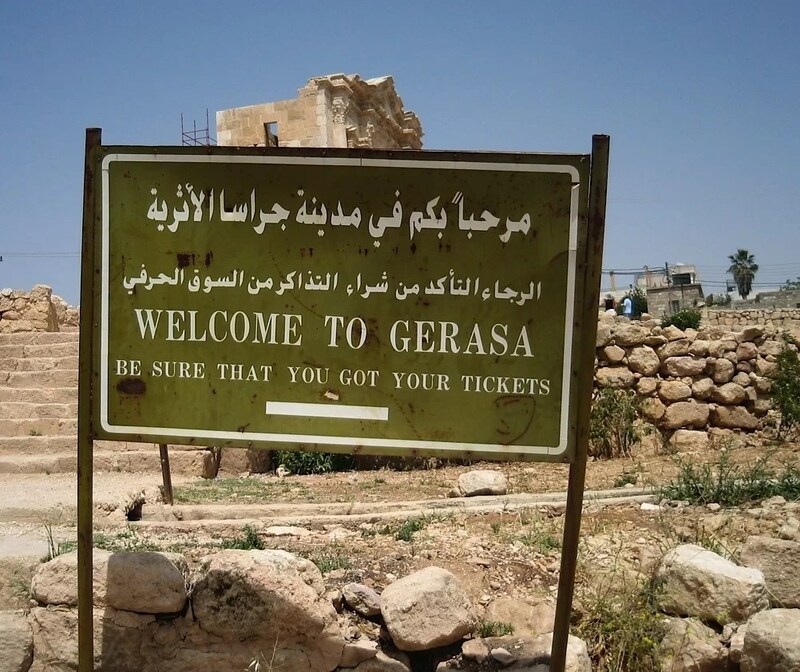 At some point during the Hellenistic and Roman periods, the town was re-founded as the city of Gerasa. It’s not entirely certain who re-founded the city, but there are several theories. Alexander the Great conquered the surrounding region in the 4th BC. Some believe that Alexander the Great or his general, Perdiccas, established the city as sort of a retirement home for old Macedonian soldiers. A few ancient Greek inscriptions also support this version of history. On the other hand, one of the old names for Jerash, “Antioch on the Chrysorrhoas”, suggests that Antioch IV, a Seleucid king, was the founder. Regardless, the city is one of the best preserved Roman cities in the Near East. It was also just one of the amazing archaeological sites we visited on our Egypt/Jordan group tour. The size of the site is really spectacular, and the level of preservation is even more impressive. Most of the public buildings were a result of donations from wealthy citizens. But there was another reason Jerash saw an influx of money. The Roman emperor Trajan annexed the Nabatean Kingdom in 106 AD. Jerash had a prime location along trade routes, which Trajan paved. This newly paved, two-lane road, called the Via Nova Traiana, brought a surge or prosperity to the city. Jerash’s construction style and layout, therefore, is primarily Greco-Roman, architecturally speaking. Let’s take a look at some of these incredibly preserved buildings! This hippodrome was built during emperor Hadrian’s reign, around 117-138 AD. It was used for sports, chariot races and gladiatorial battles. The arena’s dimensions are 245m long and 52m wide – considered on the small side! It could easily seat 15,000 spectators at a time. Today, you can watch mock gladiatorial battles and chariot races as part of a live performance put on by The Roman Army and Chariot Experience (RACE). The nymphaeum was constructed in 191 AD. This was a building consecrated to the water nymphs. It was originally covered in marble and was topped with a half-dome in the shape of a shell. The Oval Forum, below, is a somewhat unique design, and the only one of its kind in the Middle East. 56 columns surround it. You can take a 360 virtual tour of the Forum here. The Oval Forum is just one of the beautiful ruins found here. The Forum was used for numerous activities, including elections, civic speeches, and criminal trials. In 129/130 AD, the Triumphal Arch, or Arch of Hadrian, was built to celebrate his visit to the city. It was originally 22m in height and has three vaulted entrances. There’s still quite a lot of original detail remaining. However it also underwent reconstruction between 2005-2007 to bring it back to it’s former grandeur. Of course, no ancient Roman city could be without an amphitheatre, to showcase political satires and tragedies. Jerash had two theatres, North and South. This is the South Theatre, which could seat around 3,000 people. The Amphitheatre. Wouldn’t you love to watch a stage play performed here? This is the North Tetrapylon – a four-sided monument with a gate on each side. It was typically placed at a crossroads. Jerash has two; the other marks a crossroads on the southern end of the ancient city. The Persians invaded the city of Jerash in 614 AD, which caused Jerash to decline, though it persevered through to the Umayyad period. An earthquake in 749 AD, however, destroyed much of the city. What the Temple of Artemis would have looked like originally. The temple was converted to a fortress in the 12th Century by the atabeg of Damascus (an atabeg is like a governor, subordinate to a monarch. I had to look it up). The King of Jerusalem, King Baldwin II captured and burned the fortress in 1121-1122 AD. After the Crusades, the Mamluk sultanate controlled the area surrounding Jerash. 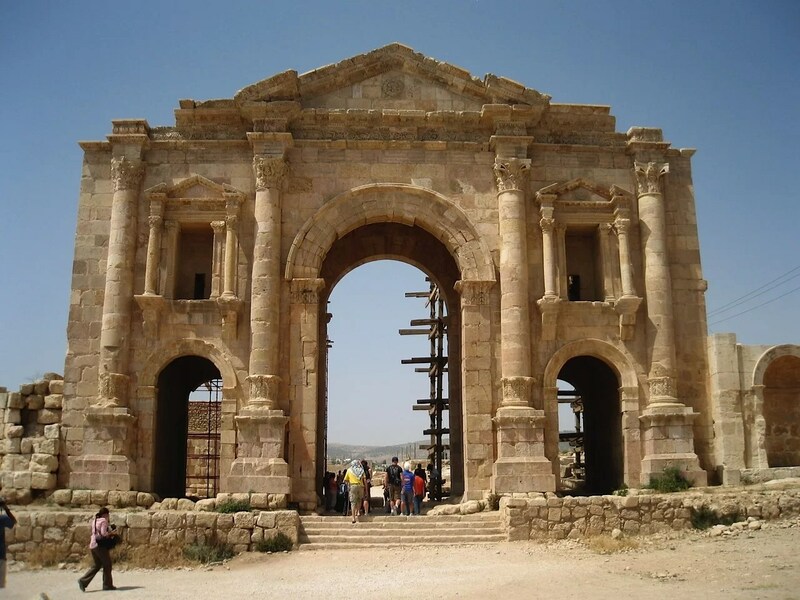 But by the 16th Century, Jerash was all but abandoned. Archaeological excavations rediscovered Jerash in the 19th Century. Not everything has been uncovered yet, either. Even as we were walking, we noticed intact mosaics on the ground, hiding underneath a fine layer of sand. In fact, archaeologists have worked here almost continuously since the 1920s! 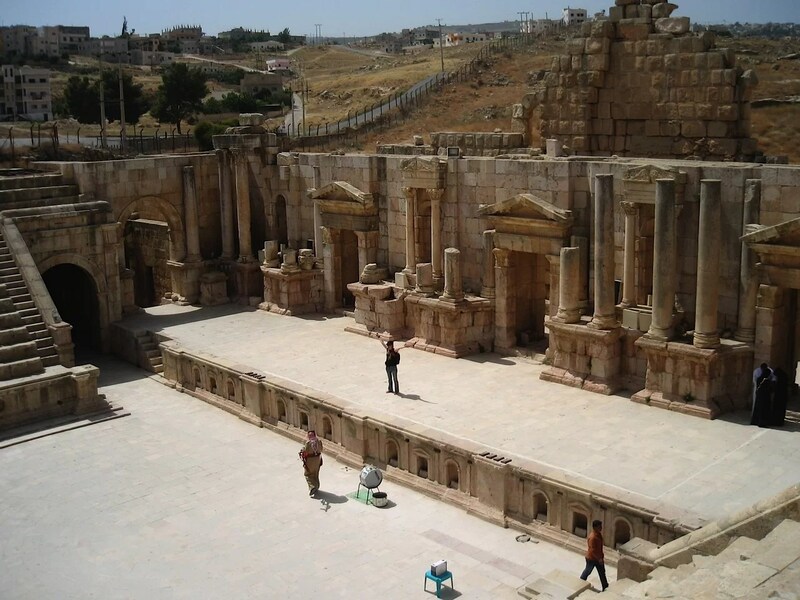 Jerash is really a highlight of any trip to Jordan and we highly recommend the side trip. In fact, the site of Jerash is now the second most popular tourist site in Jordan. Petra, of course, maintains the Number 1 spot. 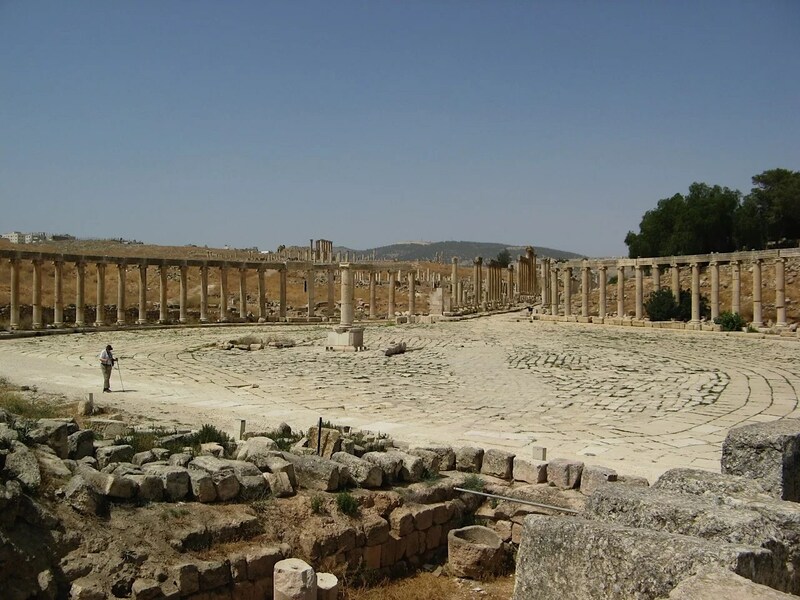 Allow 3-5 hours to explore the site of Jerash fully. There’s a lot to see here! 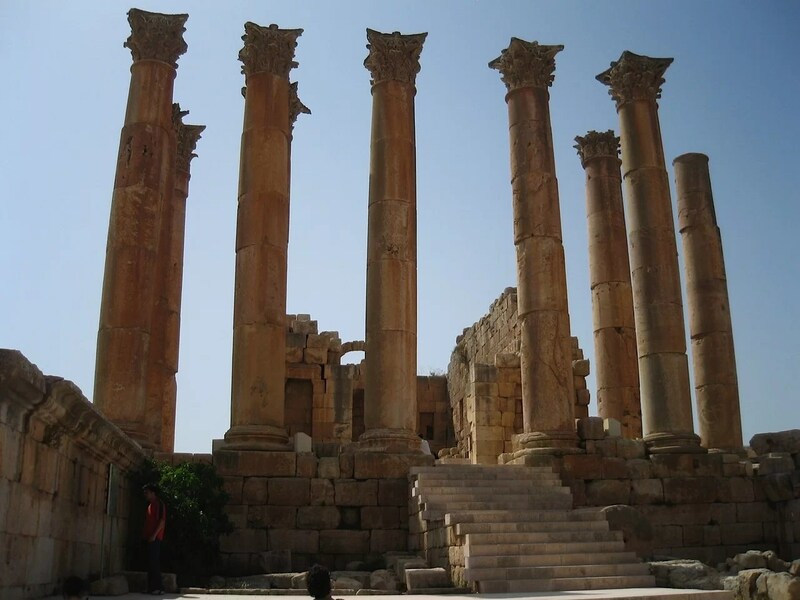 See updated entrance fees to Jerash and other sites in Jordan here. 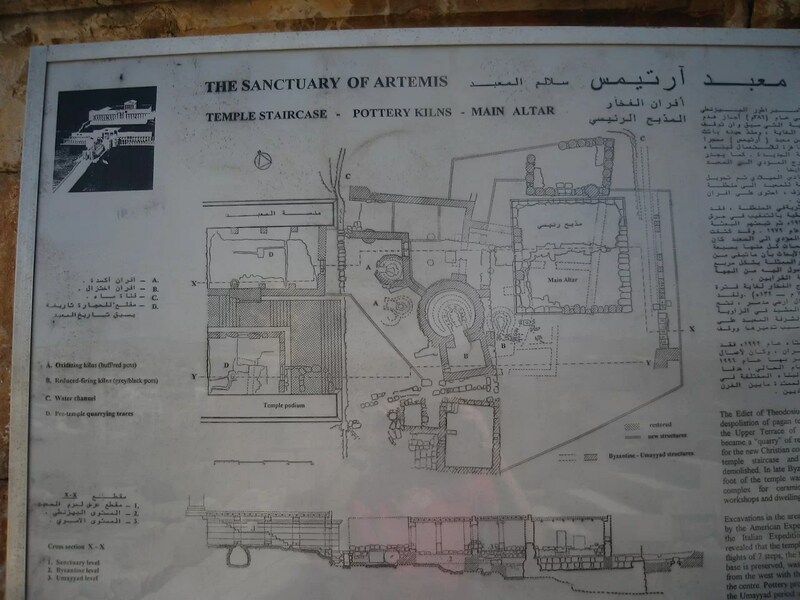 This entry was posted in Jordan and tagged archaeology, columns, gerasa, jerash, jordan, ruins by Darlene. Bookmark the permalink.